Making its fourth flight of the year, SpaceX’s Falcon 9 rocket has deployed the JCSAT-14 communications satellite Friday. The mission, which included another – and successful – experimental attempt to recover the rocket’s first stage, launched from Cape Canaveral at the start of a two-hour window that opened at 01:21 local time (05:21 UTC). JCSAT-14 was the ninth geostationary communications satellite launched by SpaceX, with Friday’s mission the eighth time Falcon 9 has targeted a geosynchronous transfer orbit. One of these launches was shared by two satellites – ABS-3A and Eutelsat 115 West B – last March. 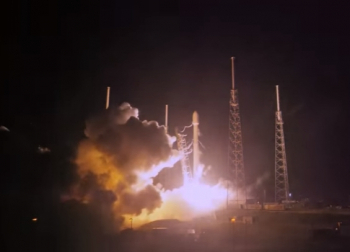 Overall, it is the twenty-fourth flight of the Falcon 9 and SpaceX’s twenty-ninth launch. 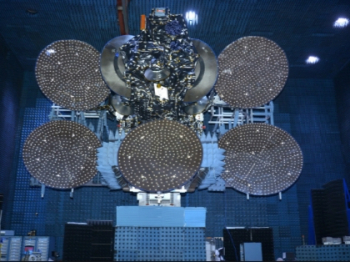 The JCSAT-14 spacecraft will be operated by Sky Perfect JSAT Corporation, a Japanese telecommunications company formed in 2008 through the merger of Sky Perfect Communications, JSAT Corporation and Space Communications Corporation. Space Systems/Loral constructed the satellite, which is based on the SSL-1300 bus. 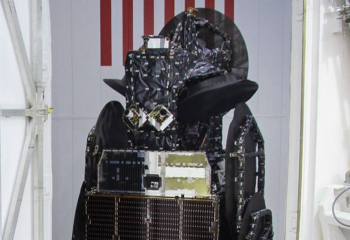 Development of JCSAT-14 was announced in June 2013, when Loral confirmed they had been awarded the contract to build the spacecraft. 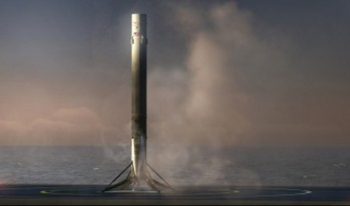 SpaceX was contracted to provide launch services – then targeted for the second half of 2015 – in January 2014. JCSAT-14 carries twenty-six C-band and 18 Ku-band transponders, providing a total bandwidth of 2,853 megahertz. It will be used to provide communications services to Asia, Oceania and Hawaii. The satellite is designed for fifteen years of service. Twin solar arrays – with a span of 25.5 metres (83.7 feet) and surface area of 44.8 square metres (482 square feet) – generate electrical power for the spacecraft, with an estimated output of between 9.8 and 11.0 kilowatts at solstice and equinox respectively at the beginning of its operational life; expected to fall to around 9.0 to 9.9 kilowatts at the end of its design life. The satellite has a dry mass of 2,194.2 kilograms (4,837.4 lb) and carries 2,498.0 kilograms (5,507.1) of fuel, giving it a total mass at launch of 4,696.2 kilograms (10,353 lb). Once in orbit, JCSAT-14 is expected to be renamed JCSAT-2B. It will replace the JCSAT-2A spacecraft – formerly known as JCSAT-8 – at a longitude of 154 degrees East. Launched in March 2002 by an Ariane 4 flying from the Centre Spatial Guyanais in Kourou, French Guiana, JCSAT-2A was designed for a minimum of eleven years’ service – with a mass at liftoff of 2,460 kilograms (5,420 lb). JCSAT-2A was itself a replacement for JCSAT-2, one of JSAT’s original pair of satellites, which was launched from Cape Canaveral on 1 January 1990 using the same launch pad which Falcon will use for Friday’s mission. 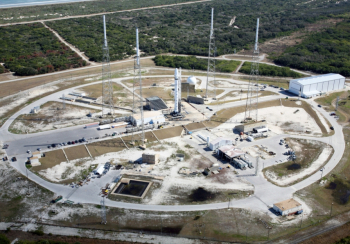 Friday’s launch will make use of Space Launch Complex 40 (SLC-40) at the Cape Canaveral Air Force Station. The pad, which was originally built as part of the Titan III’s Integrate-Transfer-Launch (ITL) complex along with nearby Space Launch Complex 41 and a shared Vertical Integration Building (VIB) which has since been demolished. The first launch from SLC-40, which also marked the maiden flight of the Titan IIIC vehicle, took place in June 1965. In total, twenty-six Titan IIIC rockets flew from Complex 40 using both the original version of the rocket and the upgraded Titan III(23)C configuration. The Titan IIIC was replaced by the Titan III(34)D in 1982, with the latter making eight of its fifteen launches from the pad. These were followed by four flights of the Commercial Titan III in the early 1990s, an enhanced Titan 34D developed by Martin Marietta in an unsuccessful attempt to enter the commercial launch market. It was the Commercial Titan III’s maiden flight that carried JCSAT-2; along with Britain’s Skynet-4A military communications satellite. The final Titan launches from SLC-40 used the Titan IV, with five Titan IVA and twelve Titan IVB rockets flying from the complex between 1994 and the vehicle’s penultimate flight in April 2005. With the Titan’s retirement Complex 40 was mothballed. After the US Air Force agreed to lease the facility to SpaceX in 2007, the remaining Titan launch structures – including the pad’s fixed and mobile service towers – were demolished in 2008. Falcon 9 launches from Cape Canaveral began with the type’s maiden flight in June 2010; Friday’s launch was the twenty-second Falcon launch from SLC-40 and the seventy-seventh orbital launch from the pad overall. One low-altitude suborbital launch has also been made from the pad; an abort test of a Dragon spacecraft which was conducted on 6 May last year. Ahead of Friday’s launch, the Falcon’s first stage – serial number F9-0024-S1 – was shipped to Cape Canaveral in mid-April following a successful static firing at SpaceX’s test site in McGregor, Texas. Integration with the second stage took place in a hangar on the pad’s southern perimeter constructed for the horizontal integration of Falcon vehicles. The rocket, without its payload, was then erected on the pad for Sunday’s final static fire test. After this test was complete the vehicle returned to its hangar and JCSAT-14 was installed along with the payload fairing which will protect it during the ascent through Earth’s atmosphere. For Friday’s launch, the Falcon 9 flew in the “Full Thrust” configuration, which uses supercold liquid oxygen to oxidise the RP-1 propellant in both the first and second stages. At a cooler temperature, the oxidiser becomes denser allowing a greater amount to be carried without increasing the volume of its tank. This and other performance enhancements over the earlier Falcon 9 v1.1 allow first stage recovery attempts to be made on most launches, including Friday’s. Previously geostationary missions required all of the first stage’s available performance leaving no fuel left to attempt a landing. Friday’s launch was fourth to use the Full Thrust Falcon 9, which is the only version of the rocket currently flying. 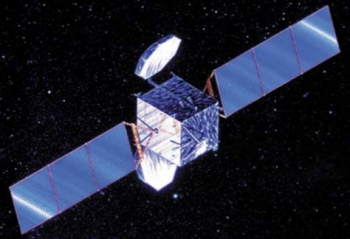 The v1.1 was retired following January’s launch of the Jason-3 environmental research satellite. Because of the low oxidiser temperature, fuelling of the Falcon occurs very close to liftoff. Following a poll at the thirty-eight-minute mark in the countdown, propellant loading began at thirty-five minutes before launch. The first stage engines underwent a chilldown, beginning at the T-10 minute mark. The final ten minutes of the countdown form an automated sequence; if the countdown has to be held once this has started, it must be reset to the beginning of the sequence before operations can continue. The need to keep the liquid oxygen at low temperature is an additional constraint on any holds in the count. Three or four minutes into the automated sequence the rocket switched to internal power, following which the Strongback, a structure used to transport the rocket to the launch pad, raised it to vertical and provided a point of connection for umbilicals which began to retract to its launch position. The flight termination system, or FTS, was armed about three and a half minutes before launch. The FTS consists of explosive charges to be used should it be necessary to command the rocket to self-destruct – for example if it should go off course and threaten a populated area. 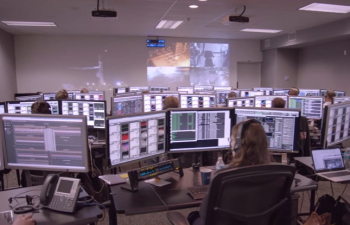 The final approval to launch came from the Range Control Officer on behalf of the US Air Force – who operate the Eastern Range – at two minutes before liftoff, and from SpaceX’s Launch Director shortly afterwards. In the final minute of the countdown, the rocket’s onboard computers conducted final checks, propellant tanks pressurised and the launch pad’s “Niagara” water deluge system was armed and activated. Ignition of the nine Merlin-1D engines powering the first stage occurred three seconds before liftoff, with the vehicle being held down to ensure everything is nominal before it is released to begin its ascent. Arranged in an octagonal or “OctaWeb” pattern, eight of the engines are clustered around a ninth in the middle of the rocket’s base. Eighty seconds into flight Falcon passed through the area of maximum dynamic pressure, or Max-Q, when the combination of air density – which decreases as the vehicle climbs – and velocity produce the greatest aerodynamic stress on the rocket. First stage flight lasted two minutes and thirty-eight seconds. Three seconds later the first and second stages separated; the former beginning its journey back to Earth and the latter continuing towards orbit with JCSAT-14. 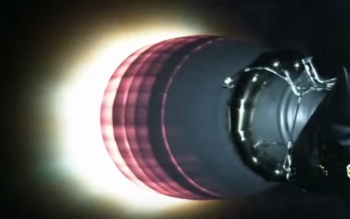 Ignition of the second stage’s single Merlin Vacuum engine came eight seconds after separation. The second stage was called upon to make two burns during Friday’s launch; the first of which lasted six minutes and four seconds. About fifty-five seconds into the burn, the Falcon’s payload fairing separated from the nose of the stage, exposing JCSAT-14 to space for the first time. When the second stage engine shut down at the end of its burn, the mission entered a seventeen minute, thirty-four-second coast phase that was followed by a fifty-nine-second burn. 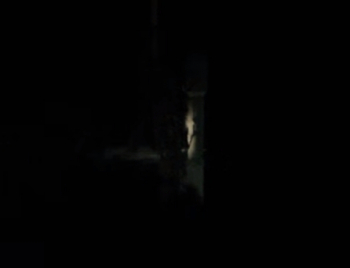 JCSAT-14 separated from the rocket four minutes and thirty-six seconds after the end of powered flight; thirty-two minutes and two seconds after liftoff. 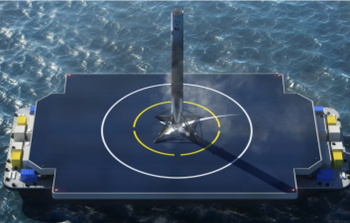 While the second stage powered JCSAT-14 towards orbit, SpaceX attempted to land the first stage atop a barge in the Atlantic Ocean. Following separation from the second stage, the first stage reoriented itself and performed a burn to put itself on course for the landing platform. As the rocket entered the atmosphere, it made it’s final dive towards the landing platform. An Autonomous Spaceport Drone Ship (ASDS) was deployed to serve as the downrange landing point for Friday’s mission as the rocket did not have sufficient fuel reserves to return to Cape Canaveral and SpaceX’s dry land landing site, Landing Zone 1 (LZ-1). The ASDS, named Of Course I Still Love You after a ship in the Culture series of stories by novelist Iain M. Banks, was last used in the successful recovery of the first stage of the Falcon 9 that launched the CRS-8 Dragon mission in April. 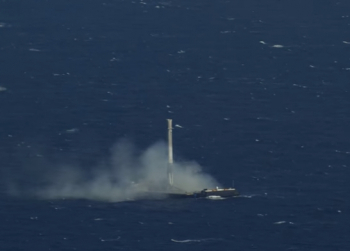 This marked the first time a first stage was successfully recovered at sea, however one land-based recovery attempt had previously succeeded. 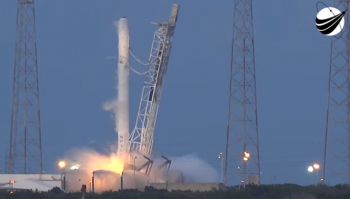 CRS-8 was a low Earth orbit mission; due to the higher velocity required for Friday’s geostationary launch SpaceX were less optimistic about the chances of succeeding. A similar attempt during the SES-9 launch in March was unsuccessful. 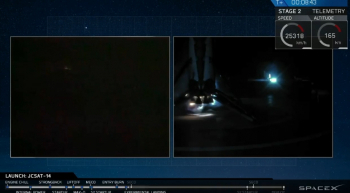 SpaceX has stressed that the landing attempt was experimental, and its success or failure had no bearing on the overall outcome of the mission, whose only primary objective is to place JCSAT-14 into its designated geosynchronous transfer orbit. However, patchy webcam coverage from the drone ship saw the stage start to light up the deck, before suddenly showing the stage sat in the middle of the “X” – marking another major milestone for SpaceX. The success was also aided by the multi-engine landing burn option, with three – as opposed to one – Merlin 1D igniting for touchdown. This stage will now be safed and prepared to be returned to the coast. Following Friday’s launch, the next scheduled mission for SpaceX will be the deployment of the Thaicom-8 communications satellite which is expected to occur early next month. Another Falcon 9 launch for JSAT is currently targeted for late this year with the JCSAT-16 satellite. JCSAT-15 is also expected to launch this year however this will be carried to orbit by an Ariane 5 rocket.